More interesting ones to come in Part 4!…. Gaucher cell ( source) Gaucher disease is a genetic disorder and is a type of lysosomal storage disease occurring due to the deficiency of glucocerebrocidase. Here the sphingolipids named glucocerebroside accumulates in the reticuloeodothelial cells resulting in the wrinkled or crumpled tissue paper appearance. Anitschkow cells. 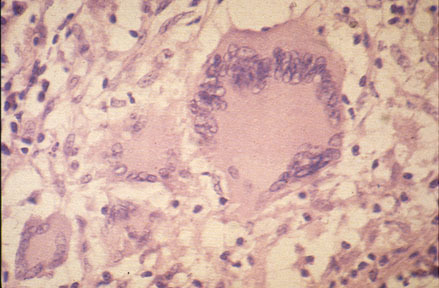 These are the cells seen in rheumatic heart disease. These are the large mononuclear cells found within the Aschoff body. These cells have oval , elongated nucleus with wavy chromatin in the centre and finger like projections on the nuclear membrane. Hence these are also called as caterpillar cells. Many such Anitschow cells fuse together to form a giant cell called as Aschoff giant cells. Bone marrow biopsy-Hairy cell Leukemia ( source ) Oligodendroglioma, a well-differentiated (WHO grade II), diffusely infiltrating glioma. Histopathologically this has a chickenwire pattern and fried egg appearance of cells because of perinuclear halo. This is an artifact, yet this is the hallmark of this tumor. Overcrowding of nuclei in papillary carcinoma thyroid ( source ) The nuclear crowding or overlapping in papillary carcinoma of thyroid can mimic eggs in basket appearance. Cut section of lymph node in lymphoma ( source) The appearance and the feel of some tumors which is whitish and firm resembling a fish flesh. Also in mesenchymal tumors eg: clear cell sarcoma. The cut section of the wilms tumor sometimes mimics fish flesh like. Cut section of liver in chronic venous congestion ( source ) Nutmeg is one of the spices which is used for flavouring many dishes, usually in ground or grated form. The central vein regions are red and the surrounding hepatic tissue is pale giving its characteristic appearance of nutmeg. the dark spots represent the dilated and congested hepatic venules whereas the paler areas represent the unaffected hepatic tissue. Popcorn cell ( source ) Popcorn shaped reed Sternberg cell also referred to as lympho-histiocytic variant. This is a small cell, with a which is very lobulated like a kernel of popcorn and has a small nucleoli. This is seen in nodular lymphocyte predominant Hodgkin lymphoma. Fatty change in heart: there is alternate yellowish streaks (fatty change) and reddish streaks ( the unaffected myocardium).. This appearance is called tigroid or tabby cat appearance. 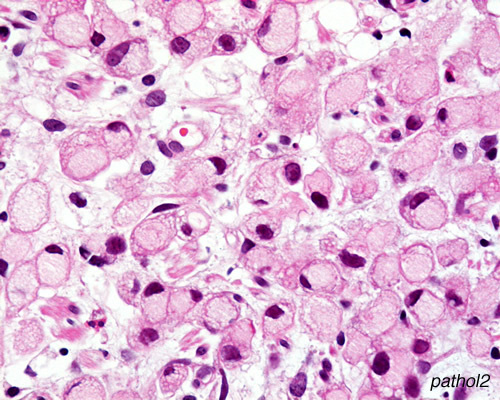 Signet ring cell carcinoma stomach ( source ) Signet ring cells are large cells with vacuolated cytoplasm pushing the single hyperchromatic nucleus to the periphery . The Langhans giant cells are multinucleated giant cells, the nuclei of which are arranged at the periphery in a horse-shoe shape. It is found in tuberculosis, the histologic hallmark of which is the presence of caseating granulomas with langhans giant cells.